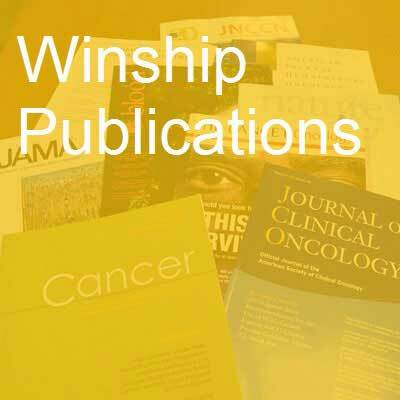 Various first authors and senior authors from Winship Cancer Institute have published 109 studies in major medical and scientific journals in the past month. Introduction to Ear and Temporal Bone Special Issue. Magliocca KR, Williams MD. Head and neck pathology. 2018; 12(3):301. PubMed PMID: 30069847; PubMed Central PMCID: PMC6081289. Idiopathic, Infectious and Reactive Lesions of the Ear and Temporal Bone. Magliocca KR, Vivas EX, Griffith CC. Head and neck pathology. 2018; 12(3):328-349. PubMed PMID: 30069844; PubMed Central PMCID: PMC6081288. Active N -Methyladenine Demethylation by DMAD Regulates Gene Expression by Coordinating with Polycomb Protein in Neurons. Yao B, Li Y, Wang Z, Chen L, Poidevin M, Zhang C, Lin L, Wang F, Bao H, Jiao B, Lim J, Cheng Y, Huang L, Phillips BL, Xu T, Duan R, Moberg KH, Wu H, Jin P. Molecular cell. 2018; 71(5):848-857.e6. PubMed PMID: 30078725; PubMed Central PMCID: PMC6136845. A miRaculous new therapy in myeloma? Boise LH. Blood. 2018; 132(10):983-985. PubMed PMID: 30190351. Point-of-sale marketing and context of marijuana retailers: Assessing reliability and generalizability of the marijuana retail surveillance tool. Berg CJ, Henriksen L, Cavazos-Rehg P, Schauer GL, Freisthler B. Preventive medicine reports. 2018; 11:37-41. PubMed PMID: 29984136; PubMed Central PMCID: PMC6030680. Management of Neuroendocrine Tumors in the Twenty-First Century. Ioachimescu AG. Endocrinology and metabolism clinics of North America. 2018; 47(3):xiii-xiv. PubMed PMID: 30098727. Interleukin-6/STAT3 Signaling is Prominent and Associated with Reduced Overall Survival in p16 Negative Oropharyngeal Squamous Cell Carcinoma. Lesinski GB, Nannapaneni S, Griffith CC, Patel M, Chen W, Chen Z, Ahmed R, Wieland A, Shin DM, Chen ZG, Saba NF. Head and neck pathology. 2018; PubMed PMID: 30191505. Antidepressant treatment resistance is associated with increased inflammatory markers in patients with major depressive disorder. Haroon E, Daguanno AW, Woolwine BJ, Goldsmith DR, Baer WM, Wommack EC, Felger JC, Miller AH. Psychoneuroendocrinology. 2018; 95:43-49. PubMed PMID: 29800779. Practice-, Provider-, and Patient-level interventions to improve preventive care: Development of the P3 Model. Bednarczyk RA, Chamberlain A, Mathewson K, Salmon DA, Omer SB. Preventive medicine reports. 2018; 11:131-138. PubMed PMID: 30003011; PubMed Central PMCID: PMC6040109. Cutting Edge: Intracellular IFN-β and Distinct Type I IFN Expression Patterns in Circulating Systemic Lupus Erythematosus B Cells. Hamilton JA, Wu Q, Yang P, Luo B, Liu S, Li J, L Mattheyses A, Sanz I, Chatham WW, Hsu HC, Mountz JD. Journal of immunology (Baltimore, Md. : 1950). 2018; PubMed PMID: 30201809. Robotic-assisted subtotal colectomy for synchronous colon cancers in a patient with indeterminate colitis - video vignette. Rosen SA, Paul Olson TJ, Peter SD, Ilyas S, Tripathi S. Colorectal disease : the official journal of the Association of Coloproctology of Great Britain and Ireland. 2018; PubMed PMID: 30238595. Trends in the Use of Knee Arthroscopy in Adults. Howard DH. JAMA internal medicine. 2018; PubMed PMID: 30264154. MERTK promotes resistance to irreversible EGFR tyrosine kinase inhibitors in non-small cell lung cancers expressing wild-type EGFR-family members. Yan D, Parker RE, Wang X, Frye SV, Earp HS, DeRyckere D, Graham DK. Clinical cancer research : an official journal of the American Association for Cancer Research. 2018; PubMed PMID: 30194074. Increased inflammation and brain glutamate define a subtype of depression with decreased regional homogeneity, impaired network integrity, and anhedonia. Haroon E, Chen X, Li Z, Patel T, Woolwine BJ, Hu XP, Felger JC, Miller AH. Translational psychiatry. 2018; 8(1):189. PubMed PMID: 30202011; PubMed Central PMCID: PMC6131242. Differential regulation of NF-kB and IRF target genes as they relate to fatigue in patients with head and neck cancer. Xiao C, Beitler JJ, Higgins KA, Wommack EC, Saba NF, Shin DM, Bruner DW, Miller AH, Cole S. Brain, behavior, and immunity. 2018; PubMed PMID: 30217537. Twenty-four-hour Learning for Residents: Is it Necessary? Meltzer CC. Radiology. 2018; :181957. PubMed PMID: 30226455. METCAM/MUC18 Decreases the Malignant Propensity of Human Ovarian Carcinoma Cells. Wu GJ. International journal of molecular sciences. 2018; 19(10). PubMed PMID: 30274262. Pooled Analysis of Nine Cohorts Reveals Breast Cancer Risk Factors by Tumor Molecular Subtype. Gaudet MM, Gierach GL, Carter BD, Luo J, Milne RL, Weiderpass E, Giles GG, Tamimi RM, Eliassen AH, Rosner B, Wolk A, Adami HO, Margolis KL, Gapstur SM, Garcia-Closas M, Brinton LA. Cancer research. 2018; PubMed PMID: 30185547. Effect of multiple-dose osimertinib on the pharmacokinetics of simvastatin and rosuvastatin. Harvey RD, Aransay NR, Isambert N, Lee JS, Arkenau T, Vansteenkiste J, Dickinson PA, Bui K, Weilert D, So K, Thomas K, Vishwanathan K. British journal of clinical pharmacology. 2018; PubMed PMID: 30171779. Implementation of Florida Long Term Care Emergency Preparedness Portal Web Site, 2015-2017. Blake SC, Hawley JN, Henkel AG, Howard DH. American journal of public health. 2018; :e1-e3. PubMed PMID: 30260693. Ruxolitinib Therapy Followed by Reduced Intensity Conditioning for Hematopoietic Cell Transplantation for Myelofibrosis - Myeloproliferative Disorders Research Consortium 114 study. Gupta V, Kosiorek HE, Mead A, Klisovic RB, Galvin JP, Berenzon D, Yacoub A, Viswabandya A, Mesa RA, Goldberg J, Price L, Salama ME, Weinberg RS, Rampal R, Farnoud N, Dueck AC, Mascarenhas JO, Hoffman R. Biology of blood and marrow transplantation : journal of the American Society for Blood and Marrow Transplantation. 2018; PubMed PMID: 30205231. Toward the control of cancer. Brawley OW, Gansler T, Wender RC. CA: a cancer journal for clinicians. 2018; 68(5):327-328. PubMed PMID: 30303534. Curcumin analogs: their roles in pancreatic cancer growth and metastasis. Nagaraju GP, Benton L, Bethi SR, Shoji M, El-Rayes BF. International journal of cancer. 2018; PubMed PMID: 30226272. A systematic review of adaptations of evidence-based public health interventions globally. Escoffery C, Lebow-Skelley E, Haardoerfer R, Boing E, Udelson H, Wood R, Hartman M, Fernandez ME, Mullen PD. Implementation science : IS. 2018; 13(1):125. PubMed PMID: 30257683. Study Design and Use of Inquiry Frameworks in Qualitative Research Published in Health Education & Behavior. Kegler MC, Raskind IG, Comeau DL, Griffith DM, Cooper HLF, Shelton RC. Health education & behavior : the official publication of the Society for Public Health Education. 2018; :1090198118795018. PubMed PMID: 30227081. Measuring Constructs of the Consolidated Framework for Implementation Research in the Context of Increasing Colorectal Cancer Screening in Federally Qualified Health Center. Kegler MC, Liang S, Weiner BJ, Tu SP, Friedman DB, Glenn BA, Herrmann AK, Risendal B, Fernandez ME. Health services research. 2018; PubMed PMID: 30260471. Diagnostic Utility of PD-L1 Expression in Lung Adenocarcinoma: Immunohistochemistry and RNA In Situ Hybridization. Gafeer MM, Hosny Mohammed K, Ormenisan-Gherasim C, Choudhary F, Siddiqui MT, Cohen C. Applied immunohistochemistry & molecular morphology : AIMM. 2018; 26(8):e86-e90. PubMed PMID: 28968265. Response to Biologics Delay Progression of Crohn's Disease in Children but Not Early Surgery. Ballengee CR, Kugathasan S. Clinical gastroenterology and hepatology : the official clinical practice journal of the American Gastroenterological Association. 2018; 16(9):1398-1400. PubMed PMID: 29775795. 5-Hydroxymethylcytosine alterations in the human postmortem brains of autism spectrum disorder. Cheng Y, Li Z, Manupipatpong S, Lin L, Li X, Xu T, Jiang YH, Shu Q, Wu H, Jin P. Human molecular genetics. 2018; 27(17):2955-2964. PubMed PMID: 29790956; PubMed Central PMCID: PMC6097011. Estimating the Impact of Changes to Occupational Standards for Silica Exposure on Lung Cancer Mortality. Keil AP, Richardson DB, Westreich D, Steenland K. Epidemiology (Cambridge, Mass.). 2018; 29(5):658-665. PubMed PMID: 29870429; PubMed Central PMCID: PMC6066423. A phase I/II dose-escalation study investigating all-oral ixazomib-melphalan-prednisone induction followed by single-agent ixazomib maintenance in transplant-ineligible newly diagnosed multiple myeloma. San-Miguel JF, Echeveste Gutierrez MA, Špicka I, Mateos MV, Song K, Craig MD, Bladé J, Hájek R, Chen C, Di Bacco A, Estevam J, Gupta N, Byrne C, Lu V, van de Velde H, Lonial S. Haematologica. 2018; 103(9):1518-1526. PubMed PMID: 29954932; PubMed Central PMCID: PMC6119151. Medical Decision-Making for Adults Who Lack Decision-Making Capacity and a Surrogate: State of the Science. Kim H, Song MK. The American journal of hospice & palliative care. 2018; 35(9):1227-1234. PubMed PMID: 29390870. Associations of Circulating 25-Hydroxyvitamin D3 Concentrations With Incident, Sporadic Colorectal Adenoma Risk According to Common Vitamin D-Binding Protein Isoforms. Gibbs DC, Fedirko V, Um C, Gross MD, Thyagarajan B, Bostick RM. American journal of epidemiology. 2018; 187(9):1923-1930. PubMed PMID: 29788105; PubMed Central PMCID: PMC6118072. Evolution of Pediatric Inflammatory Bowel Disease Unclassified (IBD-U): Incorporated With Serological and Gene Expression Profiles. Chandradevan R, Hofmekler T, Mondal K, Harun N, Venkateswaran S, Somineni HK, Ballengee CR, Kim MO, Griffiths A, Noe JD, Crandall WV, Snapper S, Rabizadeh S, Rosh JR, Walters TD, Bertha M, Dubinsky MC, Denson LA, Sauer CG, Markowitz JF, LeLeiko NS, Hyams JS, Kugathasan S. Inflammatory bowel diseases. 2018; 24(10):2285-2290. PubMed PMID: 29860529. Comparative Effectiveness of Conservative Management Compared to Cryotherapy in Localized Prostate Cancer Patients. Shah S, Young HN, Cobran EK. American journal of men's health. 2018; 12(5):1681-1691. PubMed PMID: 29877137; PubMed Central PMCID: PMC6142136. Compositional complexity of rods and rings. Schiavon CR, Griffin ME, Pirozzi M, Parashuraman R, Zhou W, Jinnah HA, Reines D, Kahn RA. Molecular biology of the cell. 2018; 29(19):2303-2316. PubMed PMID: 30024290. Interdigitated microelectronic bandage augments hemostasis and clot formation at low applied voltage in vitro and in vivo. Hardy ET, Wang YJ, Iyer S, Mannino RG, Sakurai Y, Barker TH, Chi T, Youn Y, Wang H, Brown AC, Lam WA. Lab on a chip. 2018; 18(19):2985-2993. PubMed PMID: 30109316. Studying a Rare Disease Using Multi-Institutional Research Collaborations vs Big Data: Where Lies the Truth? Johnson AC, Ethun CG, Liu Y, Lopez-Aguiar AG, Tran TB, Poultsides G, Grignol V, Howard JH, Bedi M, Gamblin TC, Tseng J, Roggin KK, Chouliaras K, Votanopoulos K, Cullinan D, Fields RC, Delman KA, Wood WC, Cardona K, Maithel SK. Journal of the American College of Surgeons. 2018; 227(3):357-366.e3. PubMed PMID: 29906615. Repositioning Dopamine D2 Receptor Agonist Bromocriptine to Enhance Docetaxel Chemotherapy and Treat Bone Metastatic Prostate Cancer. Yang Y, Mamouni K, Li X, Chen Y, Kavuri S, Du Y, Fu H, Kucuk O, Wu D. Molecular cancer therapeutics. 2018; 17(9):1859-1870. PubMed PMID: 29907594; PubMed Central PMCID: PMC6125160. Ethical challenges with treating nonadherent patients in a group practice setting. Freemyer B, Stoff B. Journal of the American Academy of Dermatology. 2018; 79(3):596-598. PubMed PMID: 29037994. Spirituality and Quality of Life in Black Patients With Cancer Pain. Bai J, Brubaker A, Meghani SH, Bruner DW, Yeager KA. Journal of pain and symptom management. 2018; 56(3):390-398. PubMed PMID: 29857179. Attrition in NRG Oncology's Radiation-Based Clinical Trials. Ulrich CM, Deshmukh S, Pugh SL, Hanlon A, Grady C, Watkins Bruner D, Curran Jr W. International journal of radiation oncology, biology, physics. 2018; 102(1):26-33. PubMed PMID: 29908786. Validation of the newly proposed American Joint Committee on Cancer (AJCC) breast cancer prognostic staging group and proposing a new staging system using the National Cancer Database. Li X, Zhang Y, Meisel J, Jiang R, Behera M, Peng L. Breast cancer research and treatment. 2018; 171(2):303-313. PubMed PMID: 29948405. Progression-Free Survival as a Surrogate End Point for Overall Survival in First-Line Diffuse Large B-Cell Lymphoma: An Individual Patient-Level Analysis of Multiple Randomized Trials (SEAL). Shi Q, Schmitz N, Ou FS, Dixon JG, Cunningham D, Pfreundschuh M, Seymour JF, Jaeger U, Habermann TM, Haioun C, Tilly H, Ghesquieres H, Merli F, Ziepert M, Herbrecht R, Flament J, Fu T, Coiffier B, Flowers CR. Journal of clinical oncology : official journal of the American Society of Clinical Oncology. 2018; 36(25):2593-2602. PubMed PMID: 29975624. Quality Improvement to Demonstrate the Lack of Reliability of the Human Papillomavirus mRNA Assay to Identify Women With Latent Human Papillomavirus Infections. Schiffman M, Huh WK, Stockdale CK, Einstein MH, Chelmow D, Flowers LC. Obstetrics and gynecology. 2018; 132(3):778-779. PubMed PMID: 30134395; PubMed Central PMCID: PMC6116530. Architectural Proteins and Pluripotency Factors Cooperate to Orchestrate the Transcriptional Response of hESCs to Temperature Stress. Lyu X, Rowley MJ, Corces VG. Molecular cell. 2018; 71(6):940-955.e7. PubMed PMID: 30122536. Antimicrobial Prophylaxis for Adult Patients With Cancer-Related Immunosuppression: ASCO and IDSA Clinical Practice Guideline Update. Taplitz RA, Kennedy EB, Bow EJ, Crews J, Gleason C, Hawley DK, Langston AA, Nastoupil LJ, Rajotte M, Rolston KV, Strasfeld L, Flowers CR. Journal of clinical oncology : official journal of the American Society of Clinical Oncology. 2018; :JCO1800374. PubMed PMID: 30179565. Disparities in survival by insurance status in follicular lymphoma. Goldstein JS, Nastoupil LJ, Han X, Jemal A, Ward E, Flowers CR. Blood. 2018; 132(11):1159-1166. PubMed PMID: 30042094; PubMed Central PMCID: PMC6137560. Functional Connectivity in Adult Brain Tumor Patients: A Systematic Review. Fox ME, King TZ. Brain connectivity. 2018; 8(7):381-397. PubMed PMID: 30141339. Post-transcriptional regulation of Pabpn1 by the RNA binding protein HuR. Phillips BL, Banerjee A, Sanchez BJ, Di Marco S, Gallouzi IE, Pavlath GK, Corbett AH. Nucleic acids research. 2018; 46(15):7643-7661. PubMed PMID: 29939290; PubMed Central PMCID: PMC6125628. 2B4 Mediates Inhibition of CD8 T Cell Responses via Attenuation of Glycolysis and Cell Division. Laurie SJ, Liu D, Wagener ME, Stark PC, Terhorst C, Ford ML. Journal of immunology (Baltimore, Md. : 1950). 2018; 201(5):1536-1548. PubMed PMID: 30012849; PubMed Central PMCID: PMC6103805. Venetoclax, bendamustine, and rituximab in patients with relapsed or refractory NHL: a phase Ib dose-finding study. de Vos S, Swinnen LJ, Wang D, Reid E, Fowler N, Cordero J, Dunbar M, Enschede SH, Nolan C, Petrich AM, Ross JA, Salem AH, Verdugo M, Agarwal S, Zhou L, Kozloff M, Nastoupil LJ, Flowers CR. Annals of oncology : official journal of the European Society for Medical Oncology. 2018; 29(9):1932-1938. PubMed PMID: 30060083. Photoacoustic Image-Guided Delivery of Plasmonic-Nanoparticle-Labeled Mesenchymal Stem Cells to the Spinal Cord. Donnelly EM, Kubelick KP, Dumani DS, Emelianov SY. Nano letters. 2018; PubMed PMID: 30160124. Modifying a commonly expressed endocytic receptor retargets nanoparticles in vivo. Sago CD, Lokugamage M, Lando GN, Djeddar N, Shah N, Syed C, Bryksin AV, Dahlman JE. Nano letters. 2018; PubMed PMID: 30216729. Agreement between medical records and self-reports: Implications for transgender health research. Gerth J, Becerra-Culqui T, Bradlyn A, Getahun D, Hunkeler EM, Lash TL, Millman A, Nash R, Quinn VP, Robinson B, Roblin D, Silverberg MJ, Tangpricha V, Vupputuri S, Goodman M. Reviews in endocrine & metabolic disorders. 2018; PubMed PMID: 30219985. Comparing breast biomarker status between routine immunohistochemistry and FISH studies and Oncotype DX testing, a study of 610 cases. Neely C, You S, Mendoza PM, Aneja R, Sahin AA, Li X. The breast journal. 2018; PubMed PMID: 30230095. Intermolecular Allylic C-H Etherification of Internal Olefins. Nelson T, Blakey SB. Angewandte Chemie (International ed. in English). 2018; PubMed PMID: 30256503. Design and operation of reconfigurable two-dimensional DNA molecular arrays. Wang D, Song J, Wang P, Pan V, Zhang Y, Cui D, Ke Y. Nature protocols. 2018; PubMed PMID: 30250287. Indoles derived from intestinal microbiota act via type I interferon signaling to limit Graft-versus-Host-Disease. Swimm A, Giver CR, DeFilipp Z, Rangaraju S, Sharma A, Ulezko Antonova A, Sonowal R, Capaldo C, Powell D, Qayed M, Kalman D, Waller EK. Blood. 2018; PubMed PMID: 30257880. Inhibition of IGF1R enhances 2-deoxyglucose in the treatment of non-small cell lung cancer. Liu F, Liu Y, Liu X, Mao K, Zhong D, Marcus AI, Khuri FR, Sun SY, He Y, Zhou W. Lung cancer (Amsterdam, Netherlands). 2018; 123:36-43. PubMed PMID: 30089593. Secondhand Smoke Exposure in Childhood and Adulthood in Relation to Adult Mortality Among Never Smokers. Diver WR, Jacobs EJ, Gapstur SM. American journal of preventive medicine. 2018; 55(3):345-352. PubMed PMID: 30122215. Not just heads and tails: The complexity of the sperm epigenome. Gold HB, Jung YH, Corces VG. The Journal of biological chemistry. 2018; 293(36):13815-13820. PubMed PMID: 29507096; PubMed Central PMCID: PMC6130957. Targeting cancer metabolism through synthetic lethality-based combinatorial treatment strategies. Bajpai R, Shanmugam M. Current opinion in oncology. 2018; 30(5):338-344. PubMed PMID: 29994904. Myocarditis With Radiotherapy and Immunotherapy in Multiple Myeloma. Chang A, Nasti TH, Khan MK, Parashar S, Kaufman JL, Boise LH, Lonial S, Ahmed R, Nooka AK. Journal of oncology practice. 2018; 14(9):561-564. PubMed PMID: 30004825. Integrating -Omics Approaches into Human Population-Based Studies of Prenatal and Early-Life Exposures. Everson TM, Marsit CJ. Current environmental health reports. 2018; 5(3):328-337. PubMed PMID: 30054820. Chance, long tails, and inference in a non-Gaussian, Bayesian theory of vocal learning in songbirds. Zhou B, Hofmann D, Pinkoviezky I, Sober SJ, Nemenman I. Proceedings of the National Academy of Sciences of the United States of America. 2018; 115(36):E8538-E8546. PubMed PMID: 30127024; PubMed Central PMCID: PMC6130353. Surgical sterilization among US men and women with employer-based insurance: A claims data analysis. Khan AI, Patil D, Kawwass JF, Zholudev V, Mehta A. Contraception. 2018; 98(3):247-251. PubMed PMID: 29778585. Reply to J.A. Talcott. Taplitz RA, Kennedy EB, Flowers CR. Journal of clinical oncology : official journal of the American Society of Clinical Oncology. 2018; :JCO2018793141. PubMed PMID: 30179568. Antimicrobial Prophylaxis for Adult Patients With Cancer-Related Immunosuppression: ASCO and IDSA Clinical Practice Guideline Update Summary. Taplitz RA, Kennedy EB, Flowers CR. Journal of oncology practice. 2018; :JOP1800366. PubMed PMID: 30179525. Circulating γ-Tocopherol Concentrations Are Inversely Associated with Antioxidant Exposures and Directly Associated with Systemic Oxidative Stress and Inflammation in Adults. Abdulla KA, Um CY, Gross MD, Bostick RM. The Journal of nutrition. 2018; 148(9):1453-1461. PubMed PMID: 30184224. The first crystal structure of a DNA-free nuclear receptor DNA binding domain sheds light on DNA-driven allostery in the glucocorticoid receptor. Frank F, Okafor CD, Ortlund EA. Scientific reports. 2018; 8(1):13497. PubMed PMID: 30201977; PubMed Central PMCID: PMC6131172. Effects of Supplemental Calcium and Vitamin D on Expression of Toll-Like Receptors and Phospho-IKKα/β in the Normal Rectal Mucosa of Colorectal Adenoma Patients. Hodge RA, Mandle HB, Ray S, Tandon S, Peterson M, Henry A, Akter Jahan F, Bostick RM, Baron JA, Barry EL, Yacoub R, Rutherford RE, Seabrook ME, Fedirko V. Cancer prevention research (Philadelphia, Pa.). 2018; PubMed PMID: 30209117. Disparities in Postoperative Therapy for Salivary Gland Adenoid Cystic Carcinomas. Cassidy RJ, Switchenko JM, El-Deiry MW, Belcher RH, Zhong J, Steuer CE, Saba NF, McDonald MW, Yu DS, Gillespie TW, Beitler JJ. The Laryngoscope. 2018; PubMed PMID: 30194768. Catalyst-Controlled Selective Functionalization of Unactivated C-H Bonds in the Presence of Electronically Activated C-H Bonds. Liu W, Ren Z, Bosse AT, Liao K, Goldstein EL, Bacsa J, Musaev DG, Stoltz BM, Davies HML. Journal of the American Chemical Society. 2018; PubMed PMID: 30222321. Home Environment-Focused Intervention Improves Dietary Quality: A Secondary Analysis From the Healthy Homes/Healthy Families Randomized Trial. Woodruff RC, Haardörfer R, Gazmararian JA, Ballard D, Addison AR, Hotz JA, Tucker RB, Kegler MC. Journal of nutrition education and behavior. 2018; PubMed PMID: 30241706. A tethered-inchworm model of SMC DNA translocation. Nichols MH, Corces VG. Nature structural & molecular biology. 2018; PubMed PMID: 30250225. Opportunities for plant natural products in infection control. Salam AM, Quave CL. Current opinion in microbiology. 2018; 45:189-194. PubMed PMID: 30218951. The Histone Demethylase LSD1 Regulates B Cell Proliferation and Plasmablast Differentiation. Haines RR, Barwick BG, Scharer CD, Majumder P, Randall TD, Boss JM. Journal of immunology (Baltimore, Md. : 1950). 2018; PubMed PMID: 30232138. Metabolomics Approach for Validation of Self-Reported Ibuprofen and Acetaminophen Use. Dennis KK, Carter BD, Gapstur SM, Stevens VL. Metabolites. 2018; 8(4). PubMed PMID: 30248901. Penetration, Completeness, and Representativeness of the Society of Thoracic Surgeons General Thoracic Surgery Database for Lobectomy. Tong BC, Kim S, Kosinski A, Onaitis MW, Boffa DJ, Habib RH, Putnam Jr JB, Furnary AP, Cowper P, Wright CD, Jacobs JP, Fernandez FG. The Annals of thoracic surgery. 2018; PubMed PMID: 30253162. TTK promotes mesenchymal signaling via multiple mechanisms in triple negative breast cancer. King JL, Zhang B, Li Y, Li KP, Ni JJ, Saavedra HI, Dong JT. Oncogenesis. 2018; 7(9):69. PubMed PMID: 30206215; PubMed Central PMCID: PMC6133923. Photoacoustic speckle tracking for motion estimation and flow analysis. de Hoop H, Yoon H, Kubelick K, Emelianov S. Journal of biomedical optics. 2018; 23(9):1-9. PubMed PMID: 30215245. Utilization and Cost of Electronic Brachytherapy by Dermatologists from 2012-2015. Peloza K, Duszak R, Rosenkrantz AB, Blalock T, Yeung H. The Journal of dermatological treatment. 2018; :1-7. PubMed PMID: 30247932. Epigenetic Programming by Maternal Behavior in the Human Infant. Lester BM, Conradt E, LaGasse LL, Tronick EZ, Padbury JF, Marsit CJ. Pediatrics. 2018; PubMed PMID: 30257918. Exosomes, Their Biogenesis and Role in Inter-Cellular Communication, Tumor Microenvironment and Cancer Immunotherapy. Jella KK, Nasti TH, Li Z, Malla SR, Buchwald ZS, Khan MK. Vaccines. 2018; 6(4). PubMed PMID: 30261592. Predictive and on-treatment monitoring biomarkers in advanced melanoma: Moving toward personalized medicine. Tarhini A, Kudchadkar RR. Cancer treatment reviews. 2018; 71:8-18. PubMed PMID: 30273812.
p53 Function is Compromised by Inhibitor 2 of Phosphatase 2A in Sonic Hedgehog Medulloblastoma. Wei Y, Maximov V, Morrissy AS, Taylor MD, Pallas DC, Kenney AM. Molecular cancer research : MCR. 2018; PubMed PMID: 30224541. A Review of Qualitative Data Analysis Practices in Health Education and Health Behavior Research. Raskind IG, Shelton RC, Comeau DL, Cooper HLF, Griffith DM, Kegler MC. Health education & behavior : the official publication of the Society for Public Health Education. 2018; :1090198118795019. PubMed PMID: 30227078. Enhancing FcγR-mediated antibody effector function during persistent viral infection. Wieland A, Kamphorst AO, Valanparambil RM, Han JH, Xu X, Choudhury BP, Ahmed R. Science immunology. 2018; 3(27). PubMed PMID: 30242080. Anti-infectives derived from botanical natural products: an interview with Cassandra Quave. Greenway A, Quave CL. Future microbiology. 2018; PubMed PMID: 30256162. Glucose and lipid-related biomarkers and the antidepressant response to infliximab in patients with treatment-resistant depression. Bekhbat M, Chu K, Le NA, Woolwine BJ, Haroon E, Miller AH, Felger JC. Psychoneuroendocrinology. 2018; PubMed PMID: 30249443. Evaluating approaches to enhance survival in children with hypodiploid acute lymphoblastic leukaemia (ALL). Miller L, Kobayashi S, Pauly M, Lew G, Saxe D, Keller F, Qayed M, Castellino S. British journal of haematology. 2018; PubMed PMID: 30255927. A novel, simplified, externally validated staging system for truncal/extremity soft tissue sarcomas: An analysis of the US Sarcoma Collaborative database. Johnson AC, Ethun CG, Liu Y, Poultsides G, Howard JH, Bedi M, Charlson J, Tseng J, Roggin KK, Votanopoulos K, Cullinan D, Fields RC, Maithel SK, Cardona K, . Journal of surgical oncology. 2018; PubMed PMID: 30261111. The Cooperative Relationship between STAT5 and Reactive Oxygen Species in Leukemia: Mechanism and Therapeutic Potential. Mi T, Wang Z, Bunting KD. Cancers. 2018; 10(10). PubMed PMID: 30262727. Cell Synchronization by Double Thymidine Block. Chen G, Deng X. Bio-protocol. 2018; 8(17). PubMed PMID: 30263905; PubMed Central PMCID: PMC6156087.